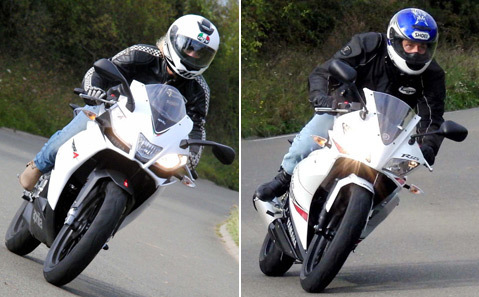 Duel Aprilia 125 RS4 VS Yamaha YZF-R125: The return to bottom of six! No offense to the purists, the reign of motorcycles 125 sports 4-stroke is now established. So we organized a duel between the two sharpest representatives of this category: The new Aprilia RS4 versus the Yamaha YZF-R125... This the duel of 125cc! Let's the battle begin! Despite a limited turning radius, the R125 is much more fun to drive in town than its competitor transalpine, mainly thanks to its flexible and available engine. Relatively coupleux, the small block 4-time agrees to resume from 4000 rpm. It is also well supported by a nice 6-speed gearbox, but it will of course not hesitate to play the selector to always stay on the good report! For the rest, the Yamaha manages to completely forget its 138 kg all full facts by offering a nice maneuverability. 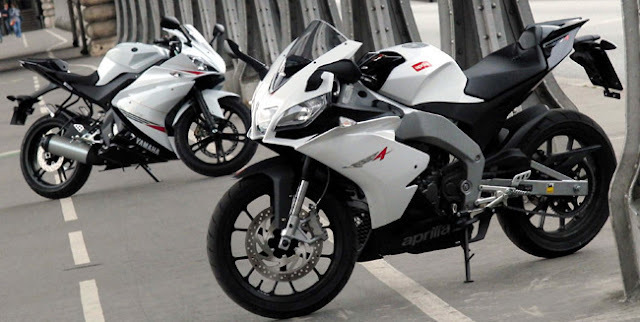 As on the larger motorcycles, we find on Aprilia an Italian particularism. The RS4 offers less easily than its competitor and to make the most of it in the city, its driver should not be idle! Its engine first is very hollow under 7000 rpm (47 mm stroke against 58.6 on Yam!) And requires constant gear changes to avoid sub-revs. In this, we find the rather capricious side of the old blocks 2-time who were forgiven, however, leaving almost 35 hp! The gearbox of the RS4 is also not free of blame. On our test bike (barely rode with its 500 km on the meter) the first report refused to lock, requiring two or even three times. Between traffic and traffic jams, our two sports are still not in their element of predilection. It is nice to spit in the paws, we are systematically taxed by the X-Max and other S-Wing, both at the start or the game of basting between the lines. As much as possible, we will also shorten as much as possible the motorway stages to find small bucolic roads. 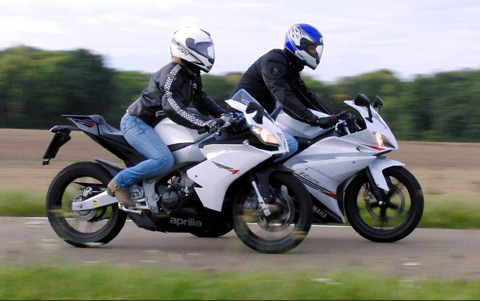 Thanks to a better length, the Aprilia takes the advantage to maintain a cruising speed correct (100-110 km / h) and hangs even the 130 km / h meter (125 km / h GPS). Behind, the Yamaha struggles to stabilize at the same cruising speed. In point on the 6th report, the breaker rather frustrating comes from 123 km / h (118 km / h GPS). We are far from the 200 km / h - or almost, "what are you like gear ?!" - some unrestrained and accessible 2-stroke motorcycles, within a certain weight / power limit, to only big cubes license holders! It's the job that comes back! Like their older 2-stroke, the Aprilia RS4 and the Yamaha YZF 125R may be our future drivers. As such, they are a good school for the rider who intends to complete his license A. Look, trajectory, braking, speed curve: the driver is completely focused on what he does, much more than on a scooter that just take you from point A to point B. In turns tight, the battle is tough and relatively balanced between our two "mini-moths". The Aprilia boasts its bright and efficient chassis and the lengthening of its engine, while the Yamaha puts more on its solid engine and its cycle part a little less lively but ultra reassuring. Particularly agile with their thin pneumatic tires (130/70 on the rear) and their small wheelbases (1345 mm on the RS4, 1355 on the YZF), the two small sports cars twirl from one turn to the other with a big ease. Too bad that in the famous climb of the 17 turning of the Vallée de Chevreuse, the slightest sub-regime is paid cash: we find ourselves at a standstill! On the other hand in the other direction - downhill! The absence of power is much less penalizing. The RS4 and YZF-R125 even have something to do with much bigger ones, thanks to their remarkable agility. Both well suspended, they offer a very convincing compromise between comfort and handling.